A vision in bright pink wanders among the besuited MEPs and smart-looking EU officials in the lavish corridors of the European Parliament in Strasbourg. 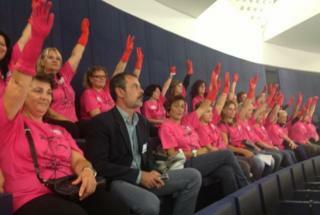 Thirty-two cleaning ladies wearing matching pink T-shirts have come all the way from Greece to plead their case, as MEPs return to debating and voting on legislation after the summer break. They are among 595 cleaning ladies whose struggle has become famous in Athens. They used to work for the Greek finance ministry until a year ago, when they were fired and replaced by cheaper workers. The decision was taken as part of the severe job cuts imposed by the EU to help Greece get back on its feet after its near-bankruptcy. "It's impossible for us to find new jobs, because we are all close to our retirement age," says Froso, one of the (former) cleaning ladies who came to the parliament. All the women are over 45. Image caption The cleaning ladies are campaigning for "work and dignity"
Ever since they got laid off, the Greek cleaners have been protesting practically every day in the centre of Athens. They also camp outside the finance ministry, which they symbolically "guard" day and night. Their persistence has made them famous all over the country and led two MEPs from the Greek far-left Syriza party to invite them to the European Parliament. "These ladies symbolise the struggle that our country has to endure, and the cruelty of the Greek government," says Sofia Sakorafa, one of the two MEPs. "By being here, they are showing to the EU the devastating consequences of the cuts in Greece on a typically vulnerable group of workers: middle-aged women." As they wander around the parliament, people turn their heads. They also attended a debate in the main chamber, while wearing red rubber gloves and holding up protest signs. Not everyone is sympathetic though. "Unemployment in Greece has never been higher, and thousands of jobs were lost in the private sector," says Georgios Kirtsos, a Greek MEP from the centre-right. "But as soon as a few jobs are lost in the public sector, suddenly everyone takes to the streets." The cleaners have gained mass attention as the first workers in Greece to win their case in a court, even though the ministry refuses to hire them back. The Greek state appealed to the Supreme Court: the verdict is due on 23 September, and if the court rules in favour of the appeal, the 595 ladies will be permanently fired.